Answer: What you saw was most likely a corona (plural coronae), and it does look like a “rainbow” of sorts. But in coronae, the colors are caused by diffraction (scattering of light) as it passes around tiny particles of water, ice crystals, dust, or smoke. In a rainbow, it’s refraction (bending of light) that creates the colors. 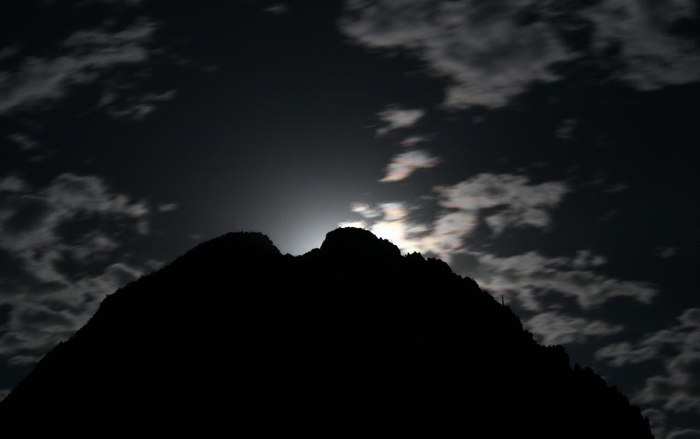 The photo above shows the Full Moon just about to rise over a nearby mountain. With the bright Moon blocked from view, the subtle colors of the corona are more easily seen. Diffraction produces colors because different wavelengths of light are scattered by differing amounts, with the strongest scattering occurring as the size of the light wave approaches the size of the particles. Where the scattered light of one color, say red, is reinforced by light from multiple particles, that’s the color you see. Diffraction also explains why our sky is blue. Earth’s atmosphere is 70% nitrogen, and since blue light has a wavelength smaller than a nitrogen molecule, that color is preferentially scattered. On Mars, by comparison, its different atmospheric composition produces a “salmon” colored sky. The Sun can also have a corona, but in the daylight the colors are even more washed out. The vast majority of luminous atmospheric effects are caused by diffraction, refraction, or reflection. They’re all easily explained using nothing more than high school physics. As a class of phenomena, they are highly varied and often spectacular. And you don’t need a special camera to capture most of them. Several websites are devoted to this topic, and present beautiful collections of images. One of my all-time favorites is Atmospheric Optics at: http://www.atoptics.co.uk/. Several books have been written about this topic. One of my all-time favorites is Rainbows, Halos, and Glories. Although I started out doing astrophotography (see some of my shots here), over the last few years I’ve found myself focusing more on atmospheric phenomena — and there’s an infinite variety to see. Many of my posts are based on those photos. I use a Canon EOS 20D these days, supplemented by wide-angle and telephoto lenses. Readers: Do you have a photo (either astronomy- or meteorology-related), and think it would make a good topic for a Sky Lights post? If so, please contact me and we’ll discuss it. The only requirement: the photo must show something seen in the sky, day or night. That’s a fairly broad genre.